With their long oars, they have reminded people of the graceful water striders that seem to magically stay afloat on the surface. But it's not magic that keeps a drift boat running with the river, it is skill. The oars dip into the water, sometimes to help guide the boat through swift, rocky rapids, other times to slow its progress so the passenger in the bow can cast to shore or work an enticing river pool. On this day I was the lucky passenger and Tony Ritter, a licensed New York guide from Narrowsburg, was showing me his skills both in keeping a drift boat on course and directing me to where the fish were hiding. We were floating the upper Delaware River from Tony's home town to the famous Zane Grey Pool at Lackawaxen, a distance of some I I miles. If there is a prettier, more inspiring place in Pennsylvania than this stretch of the river, I don't think I know it. As we glided through the mountain chutes Tony said that you'd think you were in Montana or some other Rocky Mountain state, and he was right. With the road slicing miles away from river, this was deep wilderness and the boat the only practical way to reach most of the shoreline. Our primary goal this day was to catch a few shad, but alas the best laid plans of mice and men. The trip came in mid May, about a week after the 12-day rain we experienced earlier in the month. The river was still high, fishing had just resumed, and where the shad were, we couldn't tell. Add to that the fact the water temperature was already in the mid-60's this far north, and two experienced anglers were left with a shad question mark they couldn't answer. But a good guide will quickly scope out the situation and turn his attention to fish that are biting. Despite my failure to bring along the necessary equipment, Tony had thought enough ahead to have some rods and reels rigged for smallmouth bass. He was also carrying some of his favorite smallmouth lures — a number of which I had never even thought to use on the Delaware, though I have fished the lower river for decades. With the river up and flowing strong, we felt that the main channels would be difficult to work and the fish reluctant to come out and play. Working those elongated oars, Tony kept the bow to the shore and I cast to the edges looking for smallmouth. My choice of lure, from Tony's box, was a floating minnow plug. It's a Delaware standard and usually gets smallmouth in the boat. But in these conditions, it didn't want to work. Sensing my frustration, Tony had me tie on a diving crankbait, a long-liped Shad Rap painted to look like a perch. I was more than skeptical. The color of the lure was fine, with its orange belly and green-black sides a perch lure is an excellent bass bait. But a diving crankbait? To my mind the lure would just get caught in the Delaware rocks and we'd spend more time retrieving hang-ups than fish. The next piece of the puzzle was finding breaks in the shoreline where the river's harsh flow was slowed, or where a slight back flow was formed. My first bass came from what I like to refer to as a door stop — a little spit of land that juts out only a few feet, but provides a respite for the rushing river. When we found our first doorstep we found our first smallmouth. Whoo-weee! Tony with a nice Upper Delaware River bronzeback that nabbed a #5 perch colored Shad Rap. I was surprised how well the diving crankbait worked in this situation. Casting to the edges of the shoreline, the lure would turn and begin its dive with a flip or two of the reel handle. 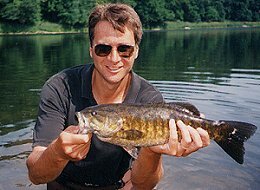 The first, and subsequent, smallmouth strikes occurred as the lure left the inches-deep shoreline and bolted into one or two feet of water. On a number of hits, I saw the bass dash out from behind a shoreline rock and chase the lure into the deeper cut. The main channel was a bit green in color, but the sideline water had been rinsed clean. With this, I could observe the action of the bait and the charge of the bass. It was great fun. But it wasn't just the fishing that had me enthralled. Tony had selected a stretch with great scenery and a great ride. Through the course of the day, we maneuvered through the Railroad Bridge Rapids; named after railroad bridge number 9; the Masthope Rapids, below Masthope Creek; the Colang Rapids; and finally the Kunkel Rapids, with a gradient that you can truly define when you turn around and look from where you just came. The Narrowsburg to Zane Grey stretch, Tony noted, is 80 percent rocky runs with some long pools but no grass flats. Another of his favorite drifts is the 9-mile long Callicoon to Skinner's Falls stretch. That area contains gentle riffles and pools and a good number of grass flats where Ritter finds topwater action for smallmouths. Besides shad and smallmouth, Tony also guides for walleye in the fall, and his bread and butter is the Delaware’s mighty trout. But the trout fishing is another story for another trip which I’m sure we’ll take. Besides his guiding work, Ritter is also chairman of the Narrowsburg Zoning Board of Appeals. But unlike me, he has learned to refrain from talking about politics.